Okay I hate to do this but between my day job and the end of con season I kind of burned myself out. I’m legit starting to feel sick. 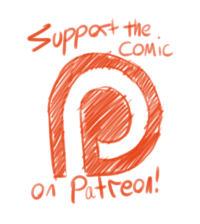 I’m going to take a couple of weeks off to work on the Patreon side comic and just some general funsies art. Also for the first time in years I’m starting to do social things like date and make new friends, so I’d like to leave the house on occasion. In the mean time you can follow me on tumblr and twitter where I post about my life and crap. I do try to respond to messages. What’s the sign that the guy in front of you is the coolest MOFO on that side of the hemisphere? Acting very casual about having a sword stuck in them. Ian you are adorable despite or maybe because of your unflappability when having a sword through your midsection. Also it’s nice to see you looking not depressed or scared. Nicole you are adorable as well and someone is going to have to explain things to Sven. 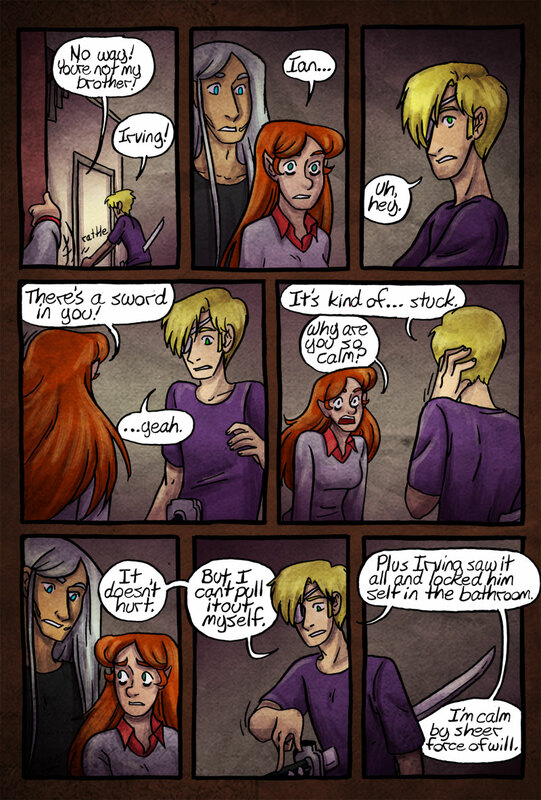 Irving, congrats on reacting appropriately to a family member being stabbed and glowing. Also, what happened to Rika? Did Ian kill her? “I am calm by sheer force of will.” What a great line. I think Nicole is responding pretty reasonably to this, but I can’t help loving Ian’s deadpan “I am calm by sheer force of will.” So awesome. Sick is no fun! I hope you feel better soon. Go out and enjoy things! He was already not presentable enough to go to work, but i imagine the reaction of his coworker if he went to his work… with still the sword stuck.